Bokos are a great gift suggestion for Mom this Mother’s Day! You are here: Home / Featured Products of the Week / Bokos are a great gift suggestion for Mom this Mother’s Day! Looking for another great gift suggestion for Mom this Mother’s Day? 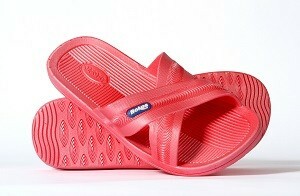 With so many sandals on the market Bokos will soon become your new favorite! These ultra-durable, easy to clean, anti-slip sandals that come in a variety of colors and sizes for men and women are perfect for wearing after a workout, around the pool, on the boat, on the beach and around the campsite. Bokos are constructed using non-porous rubber material, which helps block out dirt and keep your sandals clean. This material also helps eliminate odor and keep your Bokos smelling fresh, even when you’re not! $18; www.bokosusa.com/. I received a pair of these and I love them! They are comfortable and perfect for beach and days by the pool! Those days are alreay here in Southern California and Summer is also almost here! Self Disclosure: I received a free product to facilitate this gift guide suggestion. Photo Credit: Bokos.